Cuisinart CBM-18N Programmable Conical Burr Mill is a high quality burr grinder from the price point. You can easily think of investing your valuable money. Besides, Cuisinart CBM -18N offers you a different taste for different settings preserving full flavour and aroma. And more some additional features like LCD screen and cup selector give this cuisinart grinder a great value. 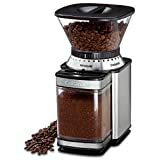 Are you so much tired finding out a good grinder for your auto drip, French press or espresso brewing with minimum expense? Have you ever tried Cuisinart CBM-18N burr mill? Cuisinart CBM-18N programmable conical burr grinder accompanies you with all the essential features you need. This is a good grinder offering you 18 grind positions especially goes well with French press, auto drip and espresso. 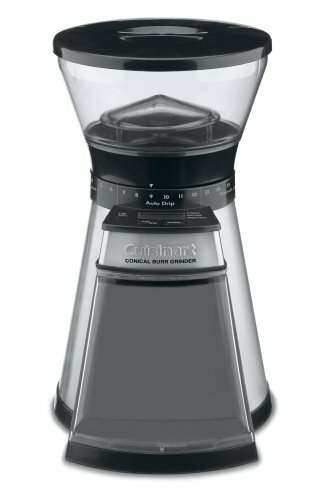 Besides, Cuisinart CBM-18N burr grinder is thoroughly programmable having ½ pound of hopper capacity, unique cup selector option, easy withdrawal grind chamber, good cord storage and full flavour with uniform grinding. Another specialty you get from Cuisinart is LCD screen just to ensure you right grind showing you settings, cup numbers and time. And extra you’ll get cleaning brush or scoop with it. Really incredible features Cuisinart CBM-18N gather in it to give you best service and best flavour for your coffee. This is the most important option-cup selector, when you confuse how much to grind per cup. Upto 14 cups you can select with Cuisinart 18n that ensure you decisive amount of coffee if you want a perfect cup. What your duty is setiing up grind position, selecting the number of cups you desire and pressing a start button and its all done. Automatically Cuisinart will stop grinding after you have got your desired cup. But if you wish you can also grind manually as it has also manual grind option. Cuisinart CBM 18N offers 18 grind selection with each 6 from extra fine to coarse. Grind is easy for 1-6 gives extra fine grind for espresso, 7-12 coarse for auto drip and 13-18 ultra-coarse for French press. Coffee ground is much uniformed and gives good flavour. This conical burr grinder bean hopper holds ½ pound of coffee bean and the grind canister is easily removable for your perfect brewing. Stainless steel Burrs work very well and are easy removable, you will enjoy its cleaning so good to clean. Cuisinart cbm-18n is not so loud, i mean not extremely quiet and grind time is also fast. One customer says that it can grind 20 seconds per 6 cups. Most of them are happy with this machine. Cuisinarat CBM-18N can handle only 120v. It doesnot support 220-240v. 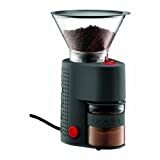 Most customers say they didnot have any problem with clogging even with dark oily beans – seems very good grinder according to the price point. Really cbm-18n works very well for espresso, drip and press. Average buyers give positive reviews on this fact. This cuisinart burr creates a mess while removing ground container. Some grounds stick to this plastic ground can and sometimes fall from the chute after removing the canister. when you run this grinder, the container vibrates so that it may displaced and for you have to hold it all the grind time. some complains cuisinart cbm-18n to have a short lifetime. So what do you think about this Cuisinart Grinder? Is this Cuisinart CBM 18 review helpful for you? Just Let me know.